I am very excited for Friday to arrive. I am going on a vacation to Daytona Beach with my wife. We will be kicking back on the beach, enjoy our first anniversary, and attempt to not get sunburned. I have been busy packing and cleaning the house so I had to dig around the internet for a picture today. Hopefully I will be coming back with many more photos. The weather for Daytona doesn't look a whole lot different compared to here in Dayton... highs in the low-mid 90's and morning low temps in the low-mid 70's. There is nothing like the smell of salt water and the feel of muggy air... it reminds you, yea, I am in Florida. Anyway, we will be dealing with similar temperatures the next few days. Today we could have an isolated shower or storm, but the chances are pretty small. Tomorrow we could deal with strong to severe storms and the same for early Friday as a cold front plows through. This will cool us off into the mid 80's for the weekend with lower humidity along with plenty of sunshine. We bounce back into the upper 80's for next week and rain returning for the middle of next week. Stay cool today and have a good one! 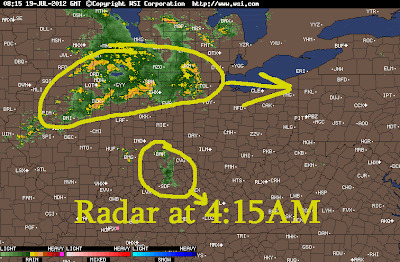 The showers and storms started popping up in Indiana around 3AM and have been going through phases. They strengthen and then weaken, then pick back up. Most of the rain we saw yesterday was across the Northern Miami Valley, but the morning rain will remain mostly to the west and south at first, then the rest of the area. Nothing is currently severe, but later this afternoon we could deal with a few strong storms, especially to the south of Dayton. Most of the rain will be early today and then later tomorrow. Thursday more storms as the system prepared to leave, but a few showers and storms Friday on its coattails. Highs will be near 90º for the next three days and then cooling off into the mid-lower 80's still for the weekend with lower humidity...but the muggy conditions return next week. The weirdest part of this heat is that you get used to it to an extent. Sure it was hot yesterday, it got to 96º, but I was like, ehhhh, yea a little hot. Anyway, stay dry this morning and have a good one! Saturday turned out quite beautiful. 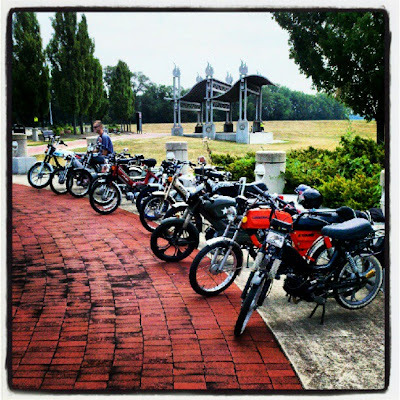 I had seventeen riders show up for my moped ride. We had most of the group there with a handful of people still missing. But everyone was super excited for the great weather and for the ride. We rolled out at 11AM and everyone was running solid.... until.... At our first stop, one of the riders decided to try and ride a dirt bike track. He was going downhill and caught the first bunny hill and caught a little air and the following hill he caught at least ten feet of air and went over his handlebars. When we ran down to him we all were freaking out... scary stuff. Sadly, he was not wearing a helmet. He had a concussion and we had to call an ambulance to get him checked out. He found out that he broke his wrist and a rib... luckily nothing worse. It could have been much worse. Since none of us were his family, we knew there was nothing we could do for him at the hospital so we contacted his family. We checked back in with him though the day and he was doing much better and in good spirits. Still not sure what made him want to try the dirt bike track, but he is paying the price now. My best wishes to him for a speedy recovery. We all decided to continue the ride and do it in honor of him...but we had to cut down on the length of the ride after the accident. 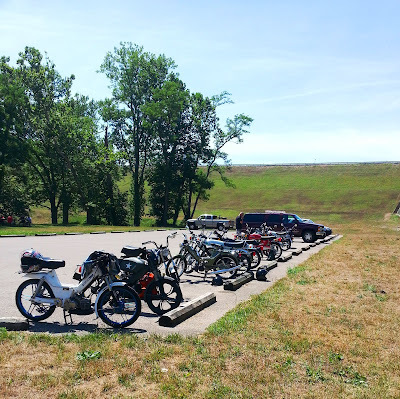 We then rode out to Germantown and we had lunch at Captain 9's and then went out to the Germantown Dam. A few went in the water to cool off, but most of us hung out in the shade. We then went back towards Dayton and a few riders broke off from the group that had other plans for the second half of the day. One of the group's normal spots for a photo shoot is the Patterson statue. You can look for me, but I am not there...I took the photo. I let one of the other guys ride my bike for the second half of the trip and I drove my truck as a chase vehicle for anyone who broke down... which was basically no one at the end of the day... other than the bike in the accident. We had a few minor issues, but all of the rest of the bikes finished the ride. Other than the accident it was a great day and a lot of fun hanging out with the entire group. DAM Riders for life. The weather yesterday was a little hotter, with a high of 92º, which is what we will reach today. We have a few morning light rain showers currently and could see a few rumbles of thunder through midday. I think the afternoon we will dry out a little, but the rain will be returning. Each day this work week we will see scattered showers and storms. So not everyone will be seeing rain each day, but at least there will be a chance for it. The best chances for rain, right now, look to be Tuesday and Thursday. Highs will stay near 90º for most of the week followed by drier conditions and low-mid 80's for the weekend. Keep the umbrella handy and have a good one! Last year I hosted Buck's Bachelor Ride. A final huge ride two weeks before my wedding. 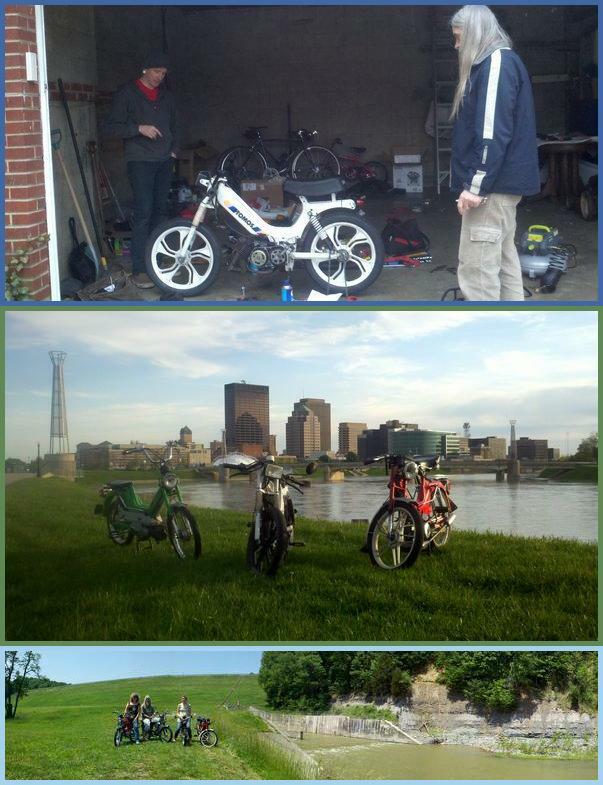 We had an amazing ride around Dayton with sixteen riders. This year I am hoping for just as many riders and more. I have a lot more planned for Buck's Ride this year. As a matter of fact I have about 85 miles planned for us tomorrow with stops at local attractions, restaurants, and dams. The ride will be leaving at 11AM tomorrow and it looks like great weather for the fun-filled day. Be sure to wave if you see us zipping around town. It will be hard to miss a gang of buzzing mopeds riding down the street, haha. I will be sure to have plenty of pictures for you on Monday in my blog entry and probably posting to Instagram/Twitter throughout the day. I am just hoping to make it as much fun as last year...if not doubled. Well, as mentioned, the weather tomorrow looks fantastic. We are dealing with a few pesky showers this morning. The cold front is currently cutting through the Northern Miami Valley and slowly pushing to the south. We will see the rain slowly move south throughout the morning and early afternoon. The good news is that the humidity will be dropping behind the front as well and slowly clearing. The rain has been nice and I wouldn't mind more of it, but I need dry weather for my ride. The weekend will be full of sunshine with only a few clouds with warm, low humidity, and great conditions. Temps will be in the mid 80's for today and tomorrow and then low 90's for Sunday, Monday, and Tuesday. Another shot for rain Tuesday and then the rain parks just south of us through the middle of next week with highs back in the upper 80's. Stay dry today, enjoy the beautiful weekend, and as always...have a good one! Get ready for more rain... It appears that early morning storms, just North of the Miami Valley, will by moving to the east. 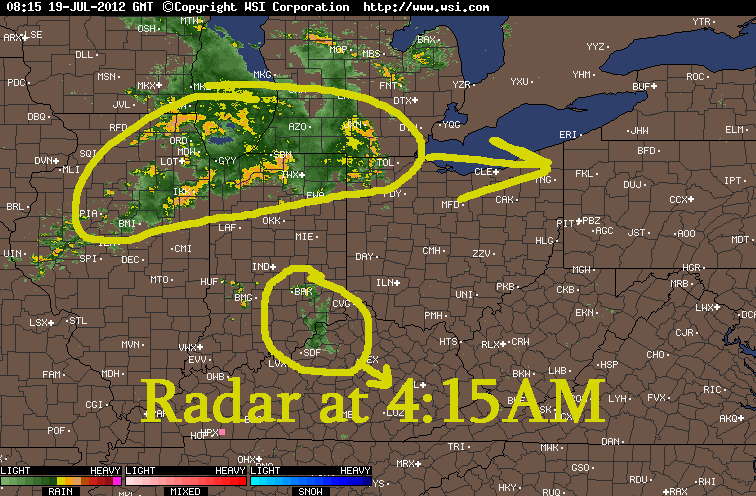 The Northern Miami Valley may catch some rain on the fringe of that rain mass through the morning hours. We will remain dry for most of the first half of the day, but storms will develop again in the afternoon and evening. 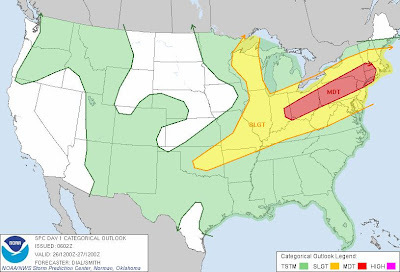 We could again see strong winds and hail with the storms today. The best time for the strong storms will be between 2PM and 8PM today during the max heating of the day. The front will push southward slowly through the day and maybe a few showers to the south tomorrow early as the front continues to move south. As long as the rain holds off long enough I think we will warm into the lower 90's again today. Cooler tomorrow with a high of 83º and then 85º for Saturday. Low 90's return for Sunday, Monday, and Tuesday, but more clouds and rain for the middle of next week cooling us off again. Once the rain leaves though tomorrow we should remain dry until the middle of next week. So stay dry, get ready for another heatwave, and have a good one! I am sure Buckeye was excited to get a haircut yesterday with the heat we had. He was starting to get a little shaggy so it was time for his grooming. As much as I hate dropping him off, I love picking him up. 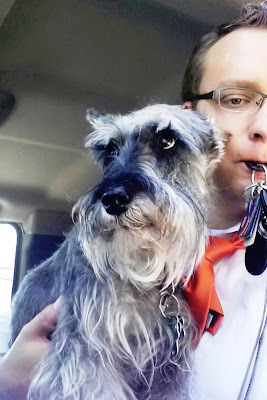 He was very excited because for the first time Dawn went with me to pick him up. I spent about six hours outside yesterday cleaning up the garage and getting rid of anything that we do not need. I even gave a few tires away that used to be on my truck. They were in slightly better condition than the tires on my truck. I am pretty unhappy with the problems I have had with my Firestone tires. I was sweating like crazy outside and tried drinking enough water to make up for all the sweating, but I still was getting a headache/light-headed still. The good news is that the garage looks great now and more room than before. Since I was already outside and hot... might as well fire up the grill. 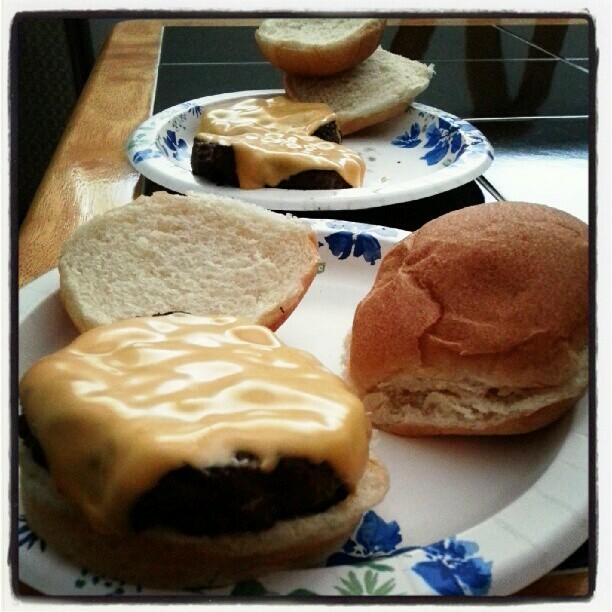 Nothing is quicker, easier, or more delicious than burgers on the grill. We did break the record high temperature yesterday. We hit 99º and broke the record by one degree set back in 1936. The heat will continue today, but only slightly cooler with a high of 94º, but a better chance for scattered showers and storms. The showers and storms will stick around tomorrow as well with some of the storms possibly containing strong winds and hail with the storms. 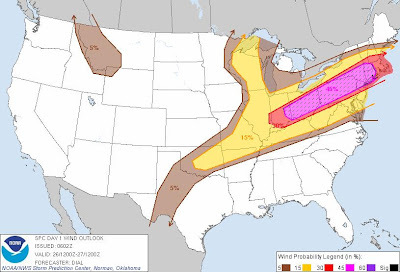 It will not be a great chance for severe criteria, but will still need to be monitored closely. The temperatures will only cool off into the mid-upper 80's for the end of the week and start to the weekend so still hot, but at least low humidity. The 90's return for Sunday and early next week so no relief from the heat yet. Stay cool and have a good one! I have mentioned on here before about my Magnum getting a new set-up. I was running the Metrakit 65, but after seeing the power out of a Treats kit(despite being cheaper)... I was sold. I was able to sell my Metrakit with a few other things and make just enough to buy the Treats reed kit without digging into my wallet so a great move in my opinion. I mowed the grass yesterday and then took ten minutes to mount up my MLM exhaust and took it around the block. I may need to down gear a little for more low-end and down jet with the reed block, but it seemed quite peppy when not four-stroking. I wish I could ride this for the long ride on Saturday, but I will be running the Polini/Maxi for the 90 mile ride since this will not be broken in yet. Anyway, just thought I would share the progress. Needless to say, I did NOT spend much time outside yesterday with the high of 96º. I was out for as short of a time as possible and then was back inside doing laundry and cleaning. Today I need to reorganize the garage and purge some things, but I will be doing all of that as quickly as possible and then back inside. Much of Ohio is under a Heat Advisory with the heat and humidity making it feel like the low 100's. We do have a chance to see isolated showers and storms today and then a slightly better chance for rain Wednesday and Thursday. We will top out at 96º today, 92º tomorrow, and then 89º Thursday followed by mid-upper 80's for the end of the week and weekend along with lower humidity. There will be plenty of sunshine this weekend, as well, so honestly a little warm, but great! Stay cool and have a good one! I think this weekend was the last wedding of the year for me. It was quite a hot and humid weekend as well. 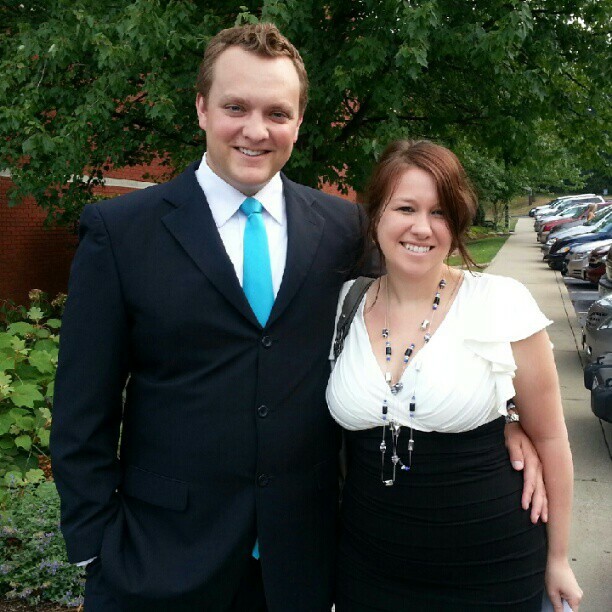 Dawn and I went back to Cleveland for the weekend and the wedding which was a lot of fun. 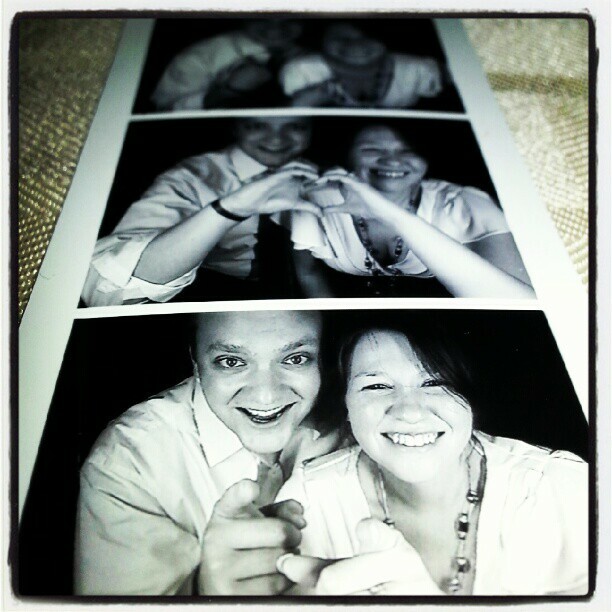 They had a photo booth at the wedding so Dawn and I naturally had some fun leaving photos for the wedding couple. We also went to a graduation party, birthday party, and tried to stay cool the entire time. The heat and humidity will be staying around for the start of the week. We hit 92º yesterday and expecting highs just slightly hotter than that the next couple days, so our fifth heat wave, of the year, if we at least hit 90º today and tomorrow. We could see an isolated shower today and tomorrow, but a much better chance for storms Wednesday as a cold front moves through cooling us off for the end of the week. We could see a few lingering showers early Thursday, but not only will you notice the cooler temps, but also the humidity dropping. For my moped ride on Saturday we should be dealing with GREAT weather. I am expecting a big turn-out for my ride. 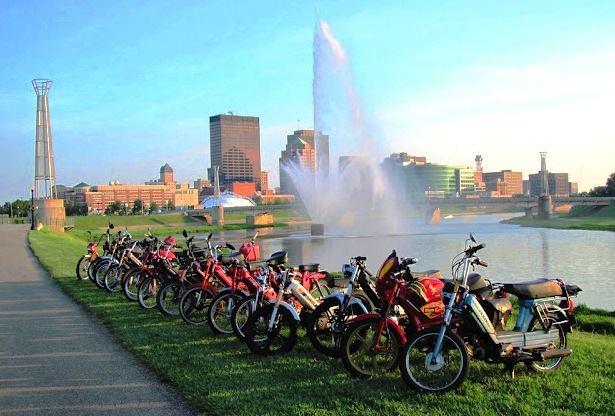 We will be riding our rally routes and it will be close to 90 miles of mopeding, so be sure to wave if you see us. Stay cool and have a good one! After a crazy morning yesterday, doing the weather on the back-up computer and keeping tabs on the train derailing in Columbus, I was pretty exhausted. I went home and took a decent nap with plans on heading down to the Ohio River later. 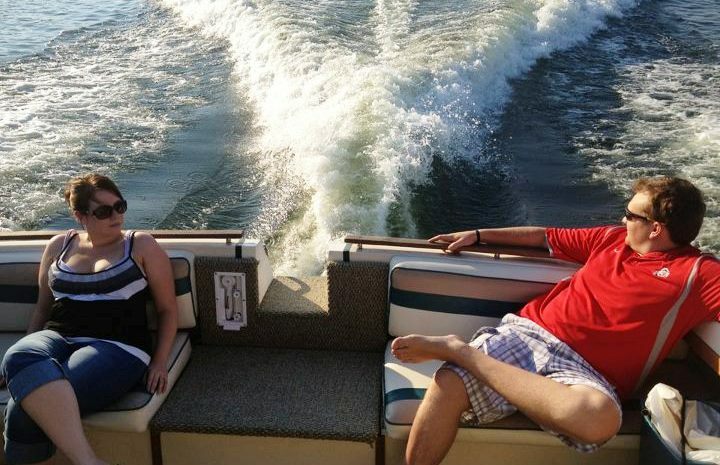 Dawn and I went down with her boss/cousin and his wife. We had a blast. We first ate at Montgomery Inn and their ribs are just as good as I had imagined and been told. We then took the boat up the river to Riverbend because there was a concert at their pavilion. We anchored down and got to listen to part of Lit and Gin Blossoms' set before we headed back down the river to the marina. It was a fun night for the four of us to enjoy the great weather before the rain returns. 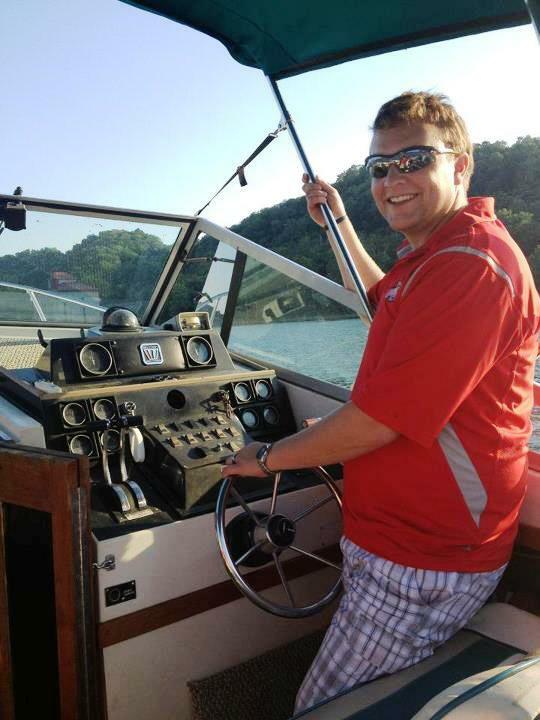 I even got to drive the boat up and back down... but I left the slick maneuvering through the marina to her cousin... haven't driven a boat very much and didn't want to crash his boat, haha. What a great day to take a ride on the river...after all the food at dinner, Dawn and I lounged out on the back of the boat. The rain returns today. Only isolated showers for today, but a better chance for scattered showers and storms for Friday, Saturday and Sunday. The models are still showing isolated showers for early next week as well so the next seven days contain a chance for rain each day and mild temperatures with highs staying in the mid 80's. Right now it looks like we could see close to an inch of rain for much of the area through the weekend. I can't remember the last time I mowed the lawn...the only thing noticeable: the tall wheat-like weeds. Ehhh, just leave them... (I really SHOULD mow) Anyway, get your rain collection buckets ready and have a good one. Yesterday morning was beautiful and the afternoon did not disappoint either. It looks like today will be much of the same...maybe a tad cooler. We saw enough sunshine to bump us barely over that 90º mark. 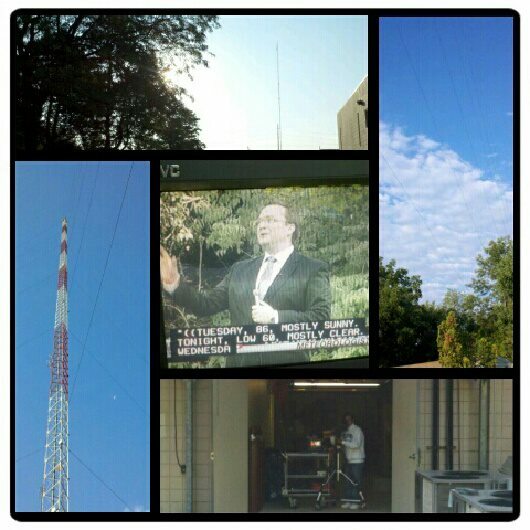 Today we are calling for upper 80's with mostly sunny skies once again. Then things start to change. Later tomorrow we could see a few isolated showers and storms, but then a much better chance for rain Friday and Saturday. Rain also looks to stick around for Sunday as well, but a lesser chance. Temps staying in the 80's clear across the seven day forecast so no big warm up yet... but I think another heat wave is around the corner. Well I have to get back to my weather show computers... having some issues and I am trying to back-up as much as I can. Have a good one! 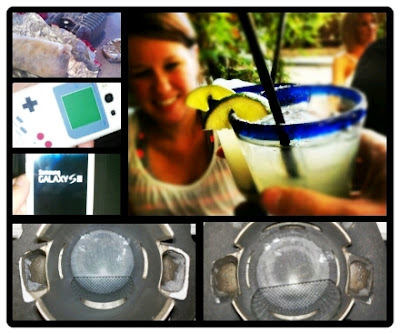 Yesterday was a pretty sweet day all around... well other than one big hick-up. I got off work, grabbed lunch with one of my moped friends. I love burritos and what goes better with a burrito than a free cookie? Not much! I then went home and did about six loads of laundry while waiting on my new phone to arrive since I had to sign for it. 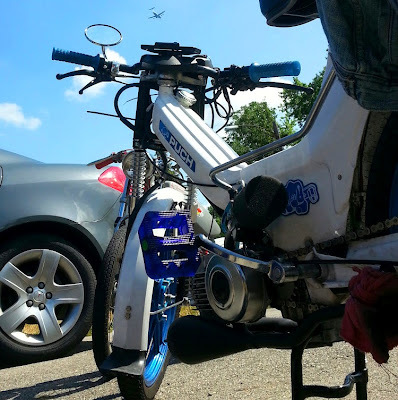 While I was waiting I did a little moped wrenching. I sold my metrakit from the Magnum and went reeds with the Treats reed kit. Essentially a cylinder swap. I know it may be a step down in quality in some people's opinion, but I think the reeds will offer more power than the metrakit. Only time will tell I guess. Anyway, the ports on the metra were larger than the treats kit so I ramped the ports on the cylinder to match up and flow better. Things were going along GREAT. 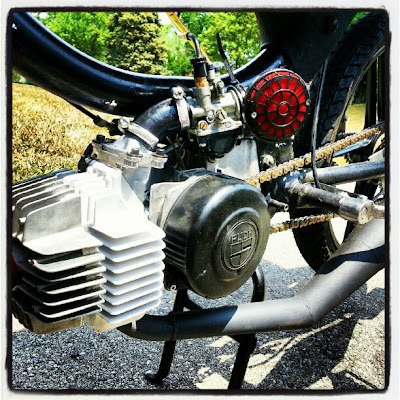 I gaped the piston rings to 0.011" and had things moving along smoothly. I was putting the cylinder back on the bike and SNAP. I am not sure how the first ring snapped, but it did. Luckily I had plenty of tacos saved up so I got a new piston ring on the way for free... including shipping... Saaaaweet! I now just wait a couple days before I can finish putting the bike back together. My phone finally came and it was such a nice day that Dawn and I went out to dinner and ate on a patio. We had a fun time with great food. I did not activate my phone yet... figured I needed sleep a little more and I will deal with (play with) my phone when I get home. Looks like that will be my last ever upgrade with Verizon, without paying a ridiculous amount. I only got three hours of sleep then woke up and felt like I slept for twelve hours. I just watched the clock slowly tick closer to time to get up. I normally am the most tired on Tuesday mornings, but today is weird. Good weird. The beautiful weather we had yesterday will continue through the day today. As a matter of fact our highs are in the mid 80's for the next seven days. Dry weather until later Thursday when a slight chance for showers and storms return. We have a better chance for rain Friday and Saturday and then things move out of here Sunday. Right now it is looking like scattered showers and storms and we can use as much rain as we can get. I walked out to check the mail yesterday and the grass was just crunching under my feet. For anyone who has green grass...I do not envy your water bill. Anyway, get out there and enjoy the beautiful day and have a good one! Well I am happy to say, the heatwave is over. 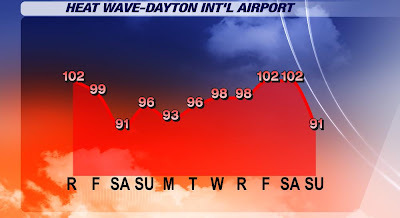 We topped out at 102 three days during the heatwave and finally are done with the 90's. We tied the record for the first day at 102, but the last two 102 days we broke the record high, which was 100. I was at an outdoor wedding and reception on Saturday and BOY was it hot! I am excited about the mid-upper 80's for the day today. Now we did NOT break the all-time longest heatwave. That was set in 1901 with 19 days... but 11 straight days of 90+ temps... not to shabby, but definitely sweaty. As mentioned, today we will reach a high of 86. The cold front is slowly pushing to the south. The far southern part of Ohio may see an isolated shower this morning as the cooler air pushes in from the north and the heat and rain move towards Kentucky. Mostly sunny later today and for the upcoming days as highs stay in the mid 80's for the entire week ahead. There is a very slight chance for rain Thursday and still a slim chance for rain for the upcoming weekend. The rain looks scattered enough that I would not change any weekend plans yet, but I will keep you posted. Enjoy the cooler temperatures and lower humidity. Have a good one! Luckily I was only moving things around the house. Dawn and I just finished painting the guest bedroom and we cleared out the entire room. The first thing I put back in there was the bed and Buckeye was excited for that. Before I got anything else into the room he was already up on his favorite bed, chilling. 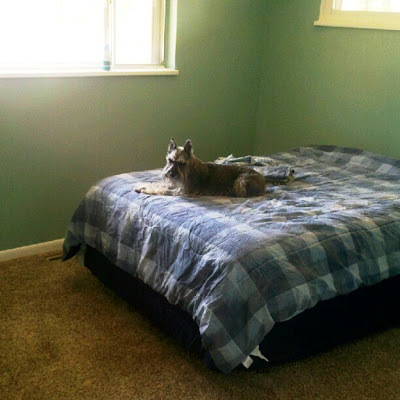 He actually was getting excited when I was moving everything back into the room because that is his little get-away. I rearranged the room about five times to maximize the space and I love the new set-up. Luckily the AC had been fixed because it was toasty again yesterday. We only got to a high of 98º because of a few clouds offering a little natural shade. I think today, with plenty of sun, we should break the 100º degree record with a high of 101º. Tomorrow we will see a few more clouds and a chance for rain by the late afternoon and evening with a high of 102º(record high is 100º too). A better chance for rain Sunday and a high near 90 and then the cold front cools us off into the mid 80's for next week. I am looking forward to that...but not looking forward to more dry weather next week. We are currently seven and a half inches below normal this year for rainfall. On the positive note, at least the temperatures will be cooling off. Stay cool and have a good one! As you found out in yesterday's blog... my air conditioner bit the dust. The house was toasty all night Tuesday night and I woke up in a pool of sweat. Nasty, I know. One of the camera operators at the television station was talking about a swamp cooler when he was in the Air Force back in the 70's. They make highly energy efficient units now, but the basic way it works... Evaporation uses energy, meaning that it actually cools off the air. 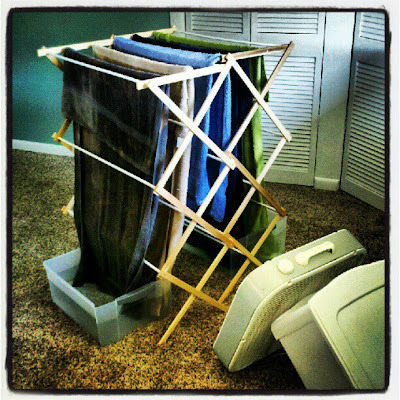 If you can expedite the drying process... without adding heat, then you can cool the air. 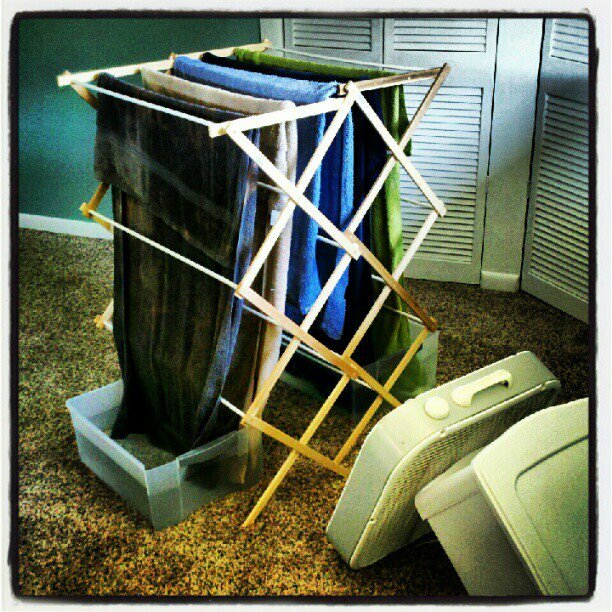 I set up two drying racks, two tubs of water, fan, and five towels. I soaked the towels and hung them in front of the fan, which was put on the High setting. The air could cut through the towels and surprisingly it worked. The room was facing the sun and normally would warm up quickly. The temperature dropped two degrees in about thirty minutes, but then, after a couple hours, the rest of the house slowly warmed up and my single unit couldn't compete with the heating. I think there are a few ways to make it more efficient if I ever want to make another(The air conditioner was replaced in the afternoon yesterday). I think the wet air needs to be pulled THROUGH the fan... not air pushing through the towels. This would mean that the area behind the fan needs to be completely covered (with a breathable, dampened material) so the moisture will be pulled away. I also think I would need a stronger fan that is belt driven. The more moving air, the faster it would pull the moisture away. The belt driven fan would be to keep moisture from getting into the motor and thus keeping the motor from getting a short due to the moisture. The material could be kept moist by taking the top of it (leave some material overlapping the top of the fan) and dip it in a tub of water and the water will naturally want to flow to the lower part in the material by gravity...keeping it moist. Just a thought for next time, but I was surprised that it did work... until the rest of the house took over. At least I had a room that was cooler than the rest. Looks like record breaking temperatures on the way. Today the record is 107 and I am calling for a high of 100, so no record today. We could see an isolated shower or storm again, but then tomorrow we should stay dry with a high of 101 and then 102 for Saturday...if we stay dry. The record for Friday and Saturday is 100. If there is any rain at the airport or very close to it then it will cool the temperatures off enough to not reach the 100 mark. The excessive heat warning is now in effect through Saturday for all of the Miami Valley. A better chance for rain Sunday as a cold front swings through and then cooling us off in the mid 80's for highs next week...looking forward to it. Stay warm and have a good one. Well, for everyone that has not had power the last few days... I feel your pain of no air conditioner. Our compressor on the AC at home went out yesterday. I was finishing painting the front bedroom and I noticed I was sweating a lot more than normal. It looks like our air conditioner finally tossed in the towel. It was already on its last legs because the AC repair man dropped off a new air conditioner last summer and said it was only a matter of time before it went, so we just rode it out with the new AC waiting in the wings. It looks like that will be hooked up later today...thankfully. Another hot day with a high of 97. Temps near 100 for the next four days and then starting a cool down on Sunday. Early next week we are expected to dip back into the 80's... looking forward to it. Only dry days out of the next seven are Friday and next Tuesday. Every other day we have a chance for a spotty shower or storm. The chance for rain today will be mainly during the afternoon so by the time fireworks start this evening we should be dry. 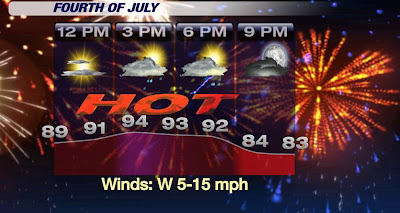 Our chance for rain is only a slight chance with the pop up showers and storms...so most of us will remain dry and hot. So get ready for the heat and have a good one! Get ready for another hot one... or rather yet, just keep doing what you are doing. We have had 5 days straight with highs at least 90 and that will continue today. As a matter of fact the forecast has the next 6 days at 90 or better, then by next Monday I am calling for a high of 89...break out the jackets. With us on the fringe of a very strong high pressure system, we could still trigger off an isolated shower and storm in the afternoons due to the heat and humidity. Friday and Saturday we will warm into the upper 90's and Friday and Monday look like the only days where our chance for rain is so small that I am keeping us dry. 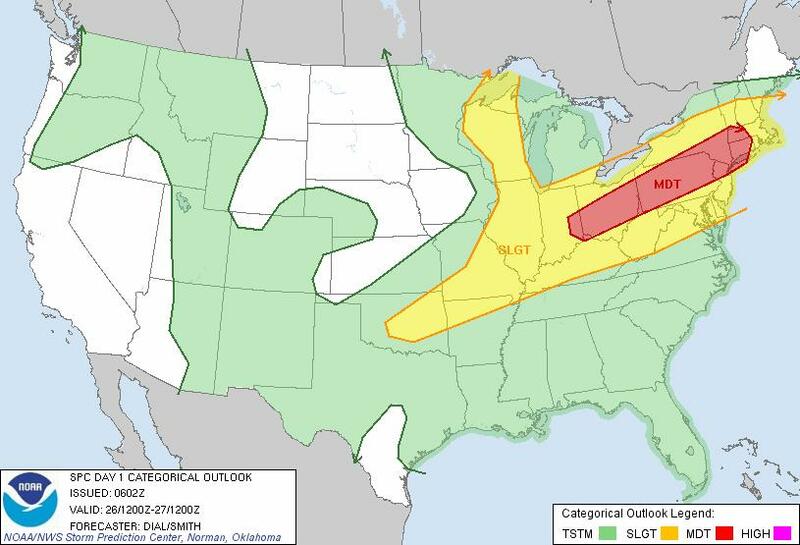 So for the most part for the week ahead: hot, humid, and isolated thunderstorms. 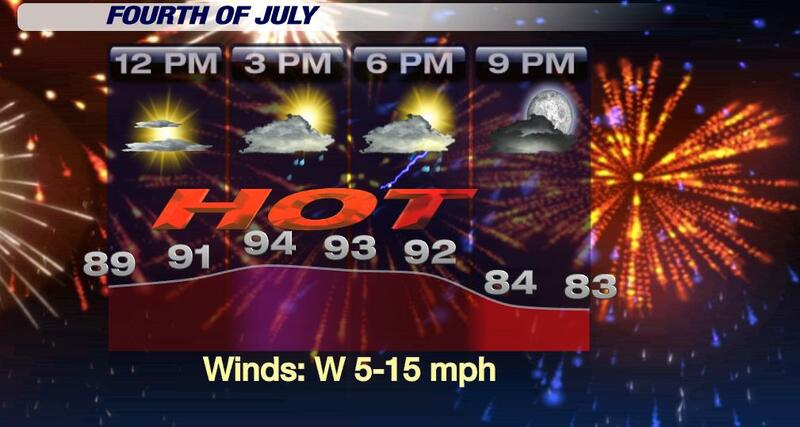 I will have a complete breakdown tomorrow for your fireworks forecast... so check back in. Stay cool and have a good one! Friday's storms were quite a doozey. 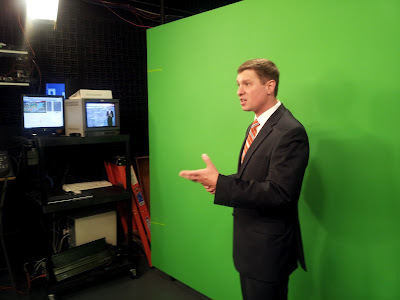 If you happened to follow my Facebook page I posted Friday midday the forecast model for the afternoon and evening. The model hit the nail right on the head. 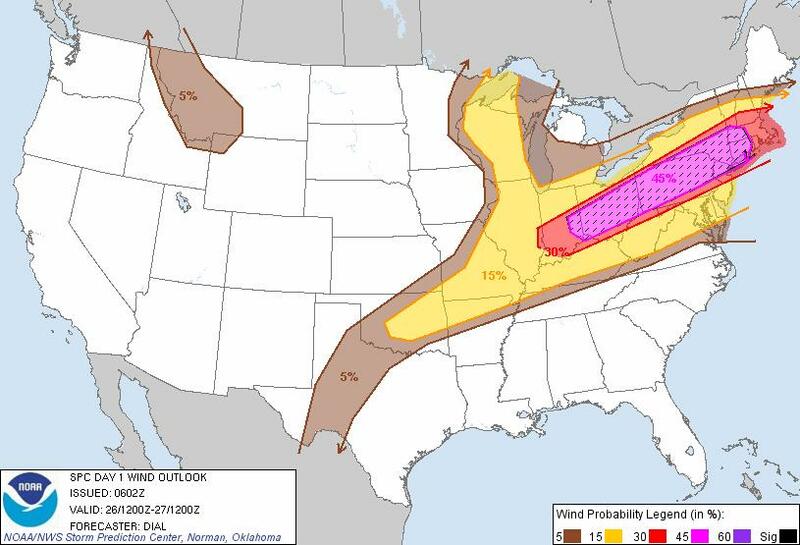 We had a derecho. It is a long-lived straight line wind packing storm that is very violent and boy was it violent! Winds at the Dayton International Airport came in with gusts up to 82 miles per hour... which are hurricane force winds. The entire First Warning Weather team was here for the coverage. Jeff Booth was at the wall and was spear heading the coverage while Chris Mulcahy and I were gathering all the storm reports and warnings to relay onto the staff and over the TV. It was honestly the first time the ENTIRE weather team was in-house. We normally have one of us reporting, but not for this event. 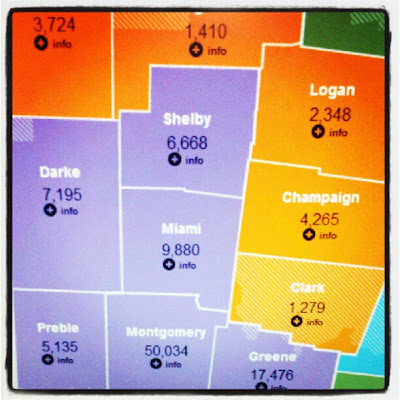 The power outage map on the Dayton Power and Light website was the craziest I have ever seen. At the height of the storm there were 175,000 DP&L customers without power. My power was out for nearly 24 hours and we had to take our frozen food to Dawn's cousin's house. We tried to make the best of the situation. We went out Friday night with all of south Dayton since their power was out. The restaurants were packed and we had quite a fun time considering the situation. I did go and see the movie Ted on Saturday. Dawn wanted to see it and it did turn out to be quite funny, but pretty vulgar. Sunday I went down to Middletown for a DAM Riders grill out and moped ride. We rode about 40 miles and my bike was keeping up with the best of them. 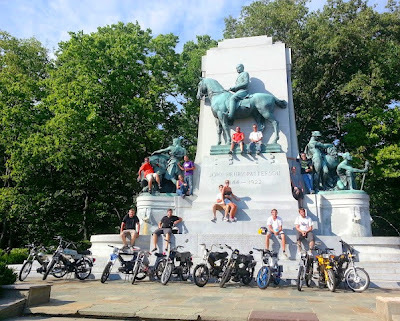 We had a decent turn-out and it was one of the best rides I have even been on. Lots of winding roads and rolling hills. We got back to the shop about ten minutes before storms arrived. The good news is that the rain the next few days does not look to be nearly as severe as Friday. We have a slight chance for afternoon pop-up showers and storms. Highs will be in the mid 90's the entire seven day forecast and the only days we expect to stay dry, Friday and Saturday, look to warm to near 100. Factor in the humidity and we will feel in the low 100's with the heat index every single afternoon for the week ahead. So hot, humid, and a chance for thunderstorms... and the broken record will keep repeating... Stay cool and have a good one!